If I had to pick one country in which to spend the rest of my life, New Zealand would be a serious contender. There is something about these islands that sings to my soul and the Kiwi way of life is a comfortable blend urban and rural, punctuated with picturesque villages and steaming hot springs. Black sand beaches, geological wonders, pristine lakes, majestic fjords, penguins, palm trees, and some of the best hiking in the world are among the selling points for me. Christchurch is one of those perfect places, in spite of the quake and tsunami damage. A resilient little city that blends the historic and modern, with a Saturday farmer’s market that can’t be missed. Wellington has Te Papa, one of the best museums I’ve ever been to anywhere in the world, and I’ve been to a few. Walking streets, cafes, a laid back waterfront, and a botanical garden that is best reached by the cable car running up the hill from the center of town. Auckland, of course, is the economic force to be reckoned with in the country. The biggest city in the nation, it still has a number of tiny hidden gems, from the Maritime Museum, tucked along the wharf, to the Rannoch, the arts trust of Sir James Wallace. As for the myriad little towns that are tucked in between rolling hills and along breathtaking coastlines, you absolutely must discover them for yourself. Rent a car or camper van and wander for as long as you can, that’s my advice. What to pack for New Zealand is a more complicated question. 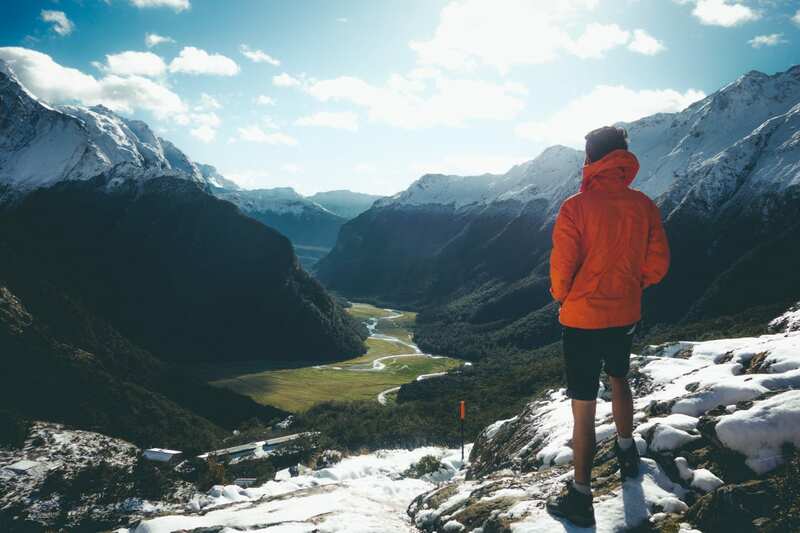 Because there are so many options, from an urban adventure with upscale night life (I spent two evenings out with an actual knight) to multi-day backcountry hikes along the Milford Track you’ll need to pack a bag with versatility in mind. New Zealand is widely known as an adventure destination and because of that reputation a lot of people think they have to pack their 80L serious hiking pack for their “off the grid” adventures in New Zealand. Unless you’re going specifically to hike the 3000 km Te Araroa, Most of your time in NZ is likely to be spent in urban centers or little towns, having adventures from a “base.” Even if you stay at campgrounds, you’ll find cabin and hostel like accommodations at almost all of them. When you take your four day hike on the South Island, you’ll find that the best option is to hire your gear, from backpack to sleeping bag and tent, to cook stoves and outerwear. Kiwi Discovery is one example of a rental company in Queenstown that provides any three items for a four day hike for only $60. Equpiment rental is so affordable that it’s not worth paying the checked bag fee. Renting is less expensive, and you won’t be lugging your stuff when you’re not using it. Pack for urban travel in a carry on bag, like the Outbreaker, to maximize your space, lighten your load, and save money. No matter what type of travel backpack you choose, a daypack is essential. If you’re traveling with your laptop and plan on carrying it out and about, the Outbreaker daypack is perfection. A built in computer sleeve, padded straps and waterproof sailcloth construction ensure that your tech will stay safe and you’ll be comfortable. If you’re sightseeing and going lighter, the Setout packable daypack is just right. It folds up into it’s own zippered pocked and packs down into almost nothing. This daypack is built to carry everything you’ll need for a day of urban adventures. If you’re flying into Auckland and staying on the North Island then you are likely to be spending more time in the urban centers and small villages. The North Island stays warmer than the South Island (hence the palm trees), so you won’t need to pack as much warm stuff as you will if you are going to the South Island, specifically in winter. In the summer, both islands have a pleasant climate. When selecting your items think about museum visits and nights out in the cities, as well as tours of Hobbiton and the hot springs of Rotorua. A light rain jacket is a good idea year round, particularly if you plan to go out on a boat tour to watch whales or to the smaller islands, as the wind and spray on the ocean are chilly. 1 pair of pants should be quick dry “hiking” style pants for your off the beaten path adventures. Consider swapping your “nicer” shoes for hiking boots if you’re going to do a lot of trails, if you’re only headed out for a handful of days, then simply upgrade your hiking sandals to a more outdoor less urban style. Do not be tempted to lighten up by not bringing the hat, scarf, or jacket, you want these on the South Island, for sure. The South Island has a decidedly more casual vibe, make your clothing choices accordingly. There are a few things that people might think they need in New Zealand that you definitely do not. Whether you are going snow skiing in July, hiking the Milford Track, or planning to camper van around the islands for a month, everything you need can be rented or found second hand very inexpensively. Kiwis are great lovers of resale shops, you’ll find at least one in every little town. Learn to scour them for your adventure necessities. Don’t pay to fly things in that you can get on the ground as a rental, or recycle. I’m a big fan of merino wool, from socks and underwear, to sweaters. New Zealand is the land of merino. Don’t pack it in your bag coming over; buy it here and take it home with you. Look for the Icebreaker Outlet stores (2 in Auckland, 1 in Albany) and start there. Arriving in February and staying for six months, (well into winter) we went straight from the airport to an Icebreaker outlet and suited up. Pro tip: Scour the resale shops in one horse towns, you’ll be shocked at the amount of merino you find at rock bottom prices. Of course you’re going to want gloves, particularly on the South Island if you’re adventuring in anything but summer (mornings and evenings can be cool!) Instead of packing them, buy a pair of possum wool gloves (every shop in Queenstown carries them). The New Zealand possum is a totally different creature than the North American possum and has the warmest “fur” of any animal other than the polar bear. Who knew? Some magician turns this into wool and the result is amazingly light, downy soft gloves, hats, scarves, socks, you name it. My possum wool gloves are in my winter coat pocket in Canada, right now, and are my favorite Kiwi souvenir. New Zealand is amazing. You should go there.